Quick Dialer is now available in the App Catalog for the US! The full version is available within the official App Catalog for the US and includes additional features. The full version does not contain ads, trial reminders, or restrictions to the list. Please support development by purchasing the full application if you enjoy using Quick Dialer. Quick Dialer is the easiest communication tool that allows you to access your most frequently contacted friends, family members, and business associates without using the keypad. Simply open Quick Dialer, tap the entry in the list for the person you�d like to call, and your phone will instantly dial the selected contact. Quick Dialer also provides one-touch access to text and picture messaging, quickly loading stored conversations for each assigned number. Your favorite contacts are presented in an elegant list format that also displays their linked photograph for easy identification. The list can be effortlessly rearranged to prioritize your most important contacts. Custom backgrounds can also be assigned and visual elements can be enabled to give Quick Dialer that personalized touch! Assigning frequently contacted phone numbers to Quick Dialer is very easy! Simply choose the person to assign from your existing stored contacts. Alternatively, you may enter a custom name and phone number for the fastest way to store a phone number. Quick Dialer also includes easy launch points for the dial pad, messaging, and the full contacts database so you can easily access other communication tools. 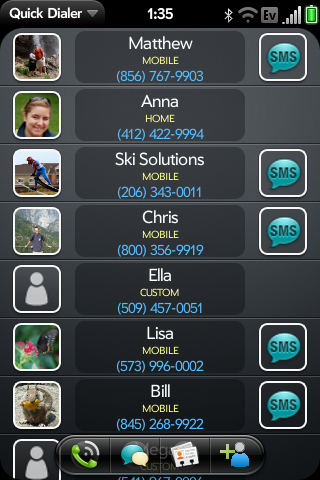 Quick Dialer is so easy to use, you�ll always use it to contact your friends and family!